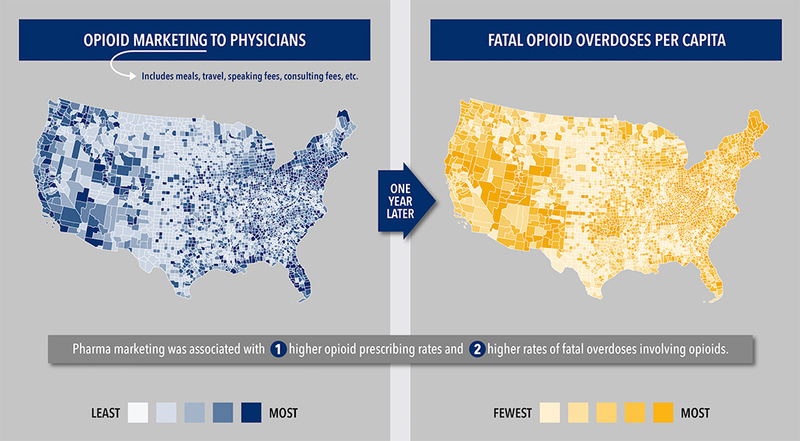 There is an undeniable link among opioid marketing, opioid prescription rates, and deaths related to opioid overdoses in the United States, according to a new study. 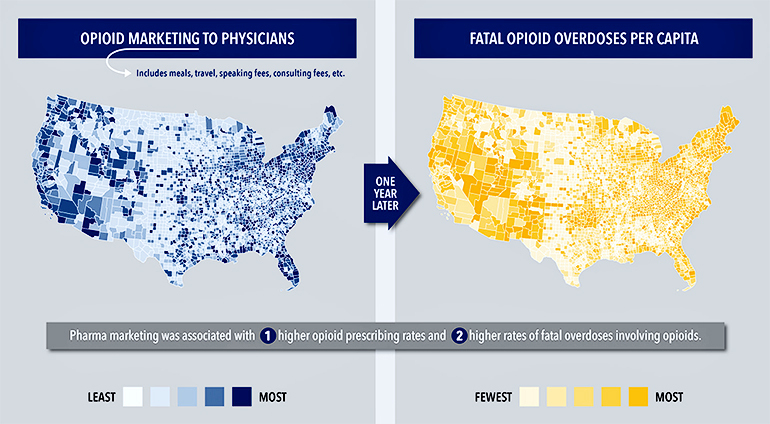 Compiling data county by county across the nation, the study paints a stark picture of the connection between the number of drug marketing interactions per county and the number of people in that county who eventually die from opioid-related drug overdoses. What exactly do these marketing interactions look like between doctors and drug representatives? They include a lot of different things, but are most commonly meals. Examples are a drug representative taking a doctor out to dinner at a conference or bringing lunch to a doctor’s office during a busy work day. They can also come in the form of speaking or consulting fees, honoraria, travel arrangements, and educational materials. How do marketing interactions influence doctors? It increases their awareness that these opioids are out there. So, I think it amounts to increased familiarity with the product. I don’t think doctors are intentionally prescribing more, but it’s clear that marketing influences what drugs they choose to prescribe and how often. Doctors are human too, and like everybody else, they are not immune to marketing efforts. What made you curious about a potential connection between marketing and opioid prescription rates? I’m a pediatrician and I see many young people who struggle with opioid addiction. Although some teens start with heroin first, teens much more commonly misuse prescription opioids. I’m acutely aware that for many kids, the first opioid they use is one that was prescribed by a doctor. One in 20 adolescents who are prescribed an opioid after surgery will go on to have long-term issues with that medication. To be clear though, many kids are not necessarily starting on opioids through a prescription of their own—in many cases they are exposed to opioids that were prescribed to other people. It is critical that we continue to address the oversupply of prescription opioids available to young people. Do drug representatives come courting at your clinic? As a doctor at Boston Medical Center and BU School of Medicine, I have zero interactions with drug representatives. That’s because we know this sort of marketing can influence physicians and there are restrictions in place preventing most of us from interacting with pharmaceutical representatives and from receiving any items of value. Many medical schools and hospitals have bans like this to protect the practice of medicine. Having said that, in a large number of clinics and hospital systems across the US, these marketing practices are allowed to continue. Additionally, I worry in particular that most smaller doctors’ offices may not have instituted larger marketing restrictions. Armed with these new findings, what should happen next? The practice of medicine can self-regulate by avoiding marketing interactions, but I think an important option on the table is for pharmaceutical companies to decrease and stop marketing opioid products altogether. State and federal legislation should also be considered. In New Jersey, for example, there’s already a cap on the total dollar amount that drug representatives can give to doctors. But our study revealed that it’s not the dollar amount that matters; instead it’s the number of interactions that take place that can impact a doctor’s prescription rates for opioids. How do these findings tie in with the lawsuit that the Massachusetts Attorney General has filed against Purdue Pharma, which accused Purdue of deceiving patients and doctors to get them to prescribe OxyContin? Our findings are consistent with one important theme from the Purdue investigation: despite the knowledge of a widespread opioid overdose problem in America, the marketing of opioids has continued unabated. And in many cases, drug companies specifically sought out providers who were already prescribing many opioids to prescribe even more. Were you surprised by the discovery of the strong link between opioid marketing, prescription rates, and overdoses by county? We suspected this would be the outcome from the get-go, but nobody had put national numbers to this problem. Find anything unexpected along the way? I was surprised that the total dollar amount spent on marketing did not matter as much as the number of marketing interactions. It reveals that the bigger public health problem is related to inexpensive, more frequent interactions, such as doctors receiving meals paid by drug representatives. The National Institutes of Health/National Institute on Drug Abuse, the Thrasher Research Fund, and the Academic Pediatric Association funded the research.The Grayken Center for Addiction at Boston Medical Center also supported the research.